(Trent Nelson | The Salt Lake Tribune) Mitt Romney speaks in Orem after winning the Republican primary for U.S. Senate, Tuesday June 26, 2018. Please stop! Please, editorial board! Please quit endorsing candidates who are or have been lap dogs for the amoral and corrupt man in the White House. One of the most powerful weapons residents of Utah have in getting our beleaguered democracy back is to vote for those who will share our values and represent our best interests, not carry water for an administration that vows to start to examine Medicare, Social Security and health care as places to slash in order to balance the budget. 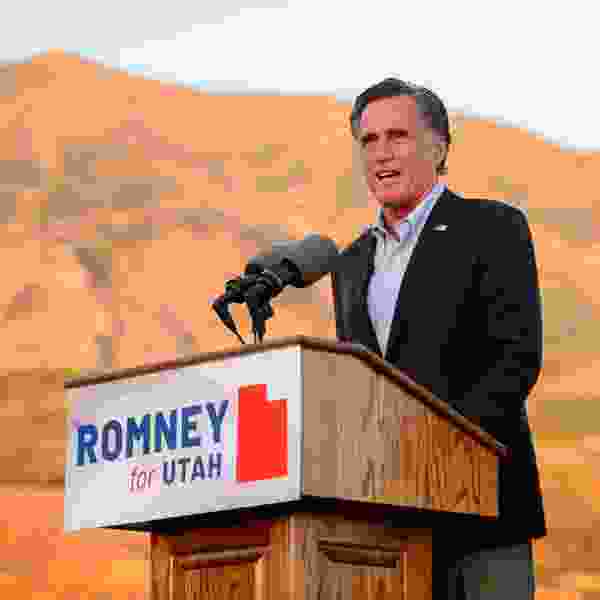 Mitt Romney is basically a carpetbagger who no longer believes that President Donald Trump is a no-good con man. Rep. Mia Love has voted for the president's agenda 97 percent of the time. That includes trying to repeal health care and abolishing protections for pre-existing conditions. I am tired of The Tribune. It used to stand up for those with fresh ideas and common sense, but has become nothing more than a ward newsletter from days gone by.